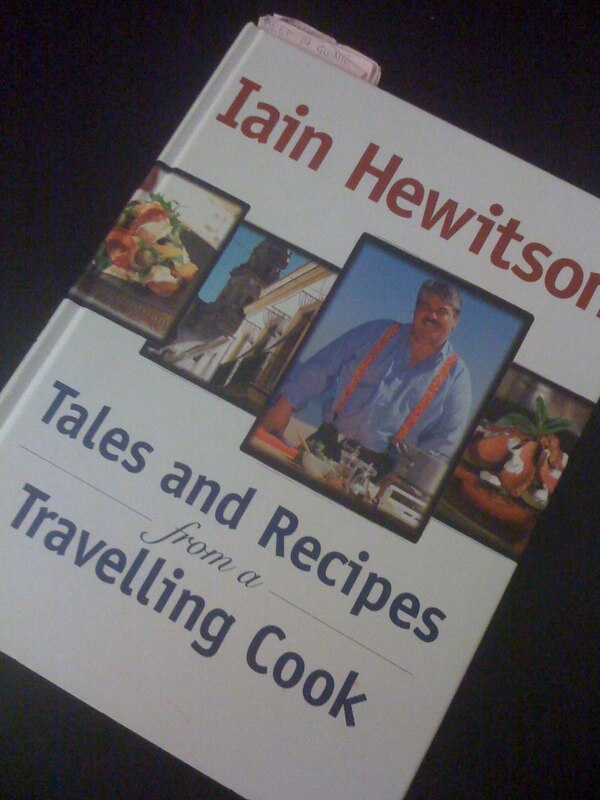 I have to admit that the choice of dish for this week’s Cook book challenge theme was decided by Hubby. We recently completed our backyard and we now love to spend time outside on warm balmy evenings. We also restored our barbecue back to it’s original glory after years of neglect. 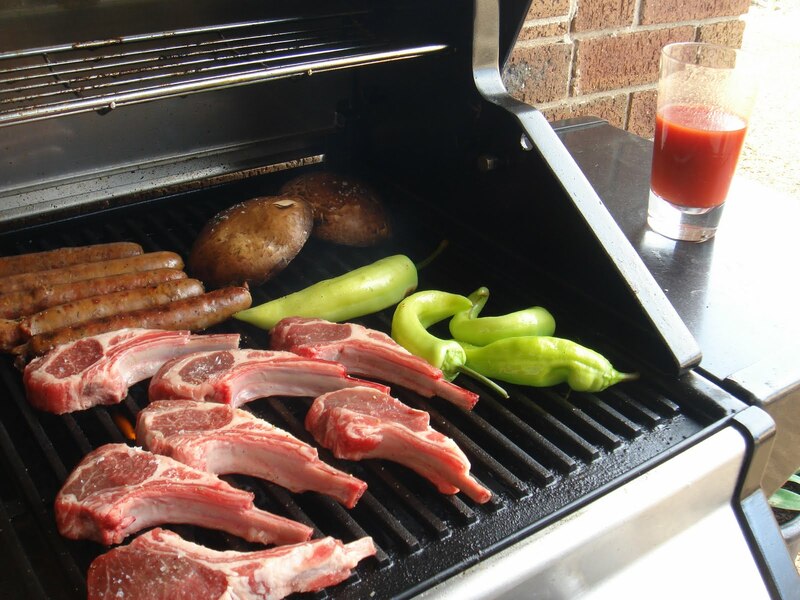 We now love cooking on our barbecue so for this week’s theme, we had a Mixed Grill. 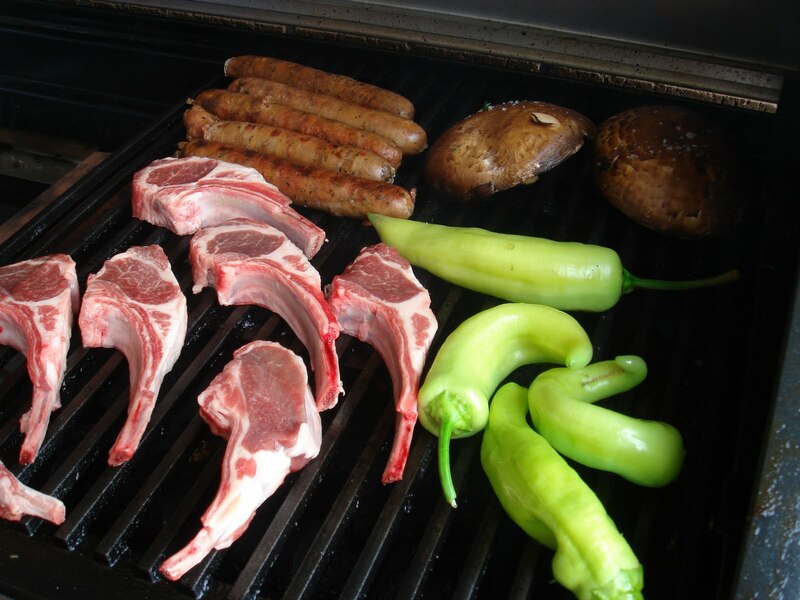 The great thing about a mixed grill is that you can use whatever meat you want. I also barbecued asparagus and yellow sweet peppers to break up all the meat. Put sausages in simmering water and simmer gently until firm. Drain, then barbecue sausages over moderate heat, turning regularly until well browned. 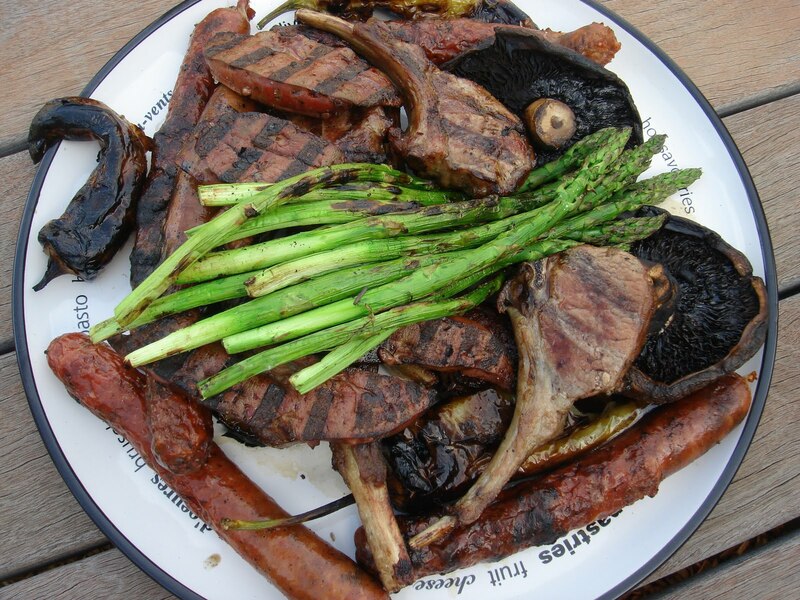 Brush meat and mushrooms with oil and barbecue over high heat to the desired degree, seasoning once sealed and removing to the side when almost ready. (Turn while cooking to create attractive grid marks). Arrange meat and mushrooms on plates sprinkle with parsley and serve with lemon wedges on the side. 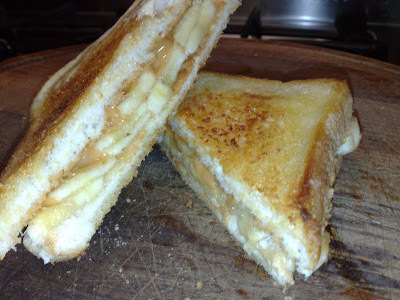 It’s a toasted sandwich with peanut butter and bananas. What more can I say? If you really need the recipe you can find it here. This recipe could not be any easier. It’s great for a mid week dinner. I found this recipe in Tyler Florence’s Ultimate. You cannot go past this recipe for a quick and delicious dinner. Wash the wings then pat dry. Put the wings in a bowl and drizzle well with olive oil and season with salt and pepper. Spread the wings out on a baking tray and roast for 25-30 minutes or until the skin is crisp and brown. Meanwhile, combine the butter, red curry paste, lime zest and juice, honey and soy sauce into a blender. Season with with salt and blend to mix then transfer to a bowl. When the wings come out of the oven, place them into the bowl with the butter and give it a toss. This week’s Filipino dish is apritandang Manok or Filipino Chicken Casserole. Again, there are many versions of this dish that can be found all over the Philippines. 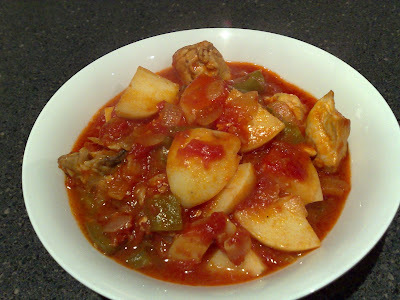 This dish originated from the Spanish when they ruled the country. 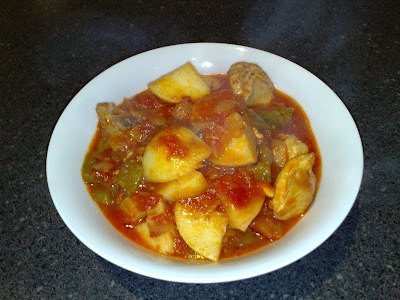 I enjoy cooking this dish as with most of my recipes it’s simple and very tasty. Heat the oil in a large saucepan and brown the chicken lightly. Then remove and set aside. Add garlic and stir-fry until golden. Then stir-fry the onions until translucent. Return the chicken and add the tomatoes, bay leaves, water, salt & pepper. Simmer for 20 minutes over low heat. Add the potatoes and simmer for 15 minutes or until nearly cooked. Add the capsicum and simmer for 5 minutes. Serve hot with plan steamed rice. Today was my last day at work at ANZ. It was sad to leave the many friends I’ve made but I’m sure I will see them again. 2 days ago, Hubby sent me beautiful flowers celebrating my last week of work. Yesterday Little one came and joined me in the office for a couple of hours. She loved playing with the calculator and any other toys she found on my colleagues desks. hehehe…. To say I didn’t do any work today is an understatement. To be honest, all I did was eat. We went out for breakfast at Torts Famous. We all had the steak and egg tort. It was steak, eggs, cheese and onions in a wrap. Since I was leaving, I had to pay departure tax – in the form of morning tea. I didn’t want to bring in the usual party pies and sausage rolls and Krispy Kreme doughnuts. I decided to make Nachos. It was quick and very easy to prepare and it went down a treat. I topped the chips with salsa ( one hot and one mild), sour cream, mozzarella cheese ( I chose mozzarella for the stringiness) and guacamole, which I made. See recipe below. I also baked a honey chocolate cake. I found the recipe in Nigella Lawson’s Feast. It’s very chocolatey, sweet and sticky… yum! My friend LL made some fudge for me to share with the team. Thanks LL! Cut the avocados in half and remove the peel and stones. Scoop out the flesh. Put the avocado in a bowl with the lime juice and mash coursely. Should be eaten within a few hours of making. 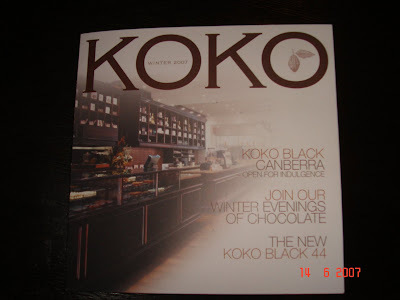 For afternoon tea, my friend AL treated me to a lovely cup of hot chocolate at Koko Black. I love this place. Their hot chocolates are to die for. I love to sit on the top floor in the nice comfy couches or on a seat next to the window and look down into the Royal Arcade. At the end of the day, I was presented with a card with the signatures of all my colleagues and gifts. 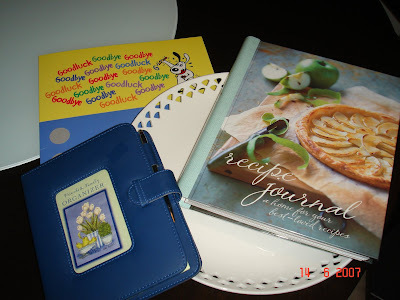 I got a nice white platter from Maxwell and Williams and a Recipe Journal. I am sure I will use both. Thanks to my friends at ANZ that made my working there an enjoyable experience. Will miss you all. For the past few days, Hubby and I have been sick. We’ve both been hit with a tummy virus… not fun at all 😦 I just hope that Little One doesn’t get it too. 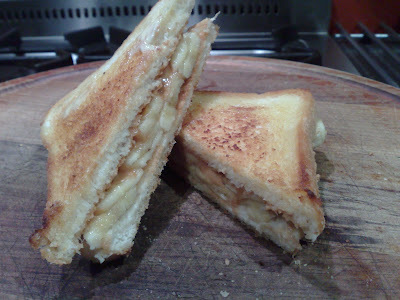 Since we were both feeling under the weather, I thought we could do with some nourishing comfort food. I had already made my own chicken stock the day before so I decided to cook up minestrone. The base recipe I used was Neil Perry’s from his book “The food I love”. But me, being me, I couldn’t but help put my own touch to it. The original recipe called for water but I decided to give it that extra lift and used my chicken stock (easily made from chicken bones, carrots, celery, onions, garlic, bay leaves, salt and pepper and simmered for 4 hours). Neil’s version also didn’t have any pasta but I added macaroni. 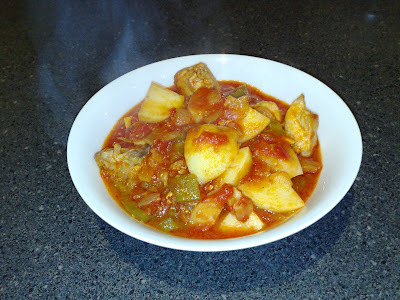 When I first made this, I thought it didn’t have that full tomato flavour that I like in minestrones so at the end of the long simmer, I added tomato sauce. Now don’t laugh… this really works! This is best served in a bowl sitting under a thick doona, in from of the TV snuggling with your loved one… and oh, with soft fresh bread. Heat the olive oil in a deep saucepan and sweat the bacon. Add the tomatoes, parsley, bay leaves and the stock. Bring to the boil and let simmer for 40 to 50 minutes. Check the season, adding more salt and pepper if necessary and add the tomato sauce. To serve, remove the bay leaves and pour into bowls. My mum grows chokos in her back yard. The Choko is a vegetable that belongs to the same family as melons, cucumbers and pumpkins. Filipinos call this vegetable sayote. My mum gave me a couple and I cooked it up with Mince pork. To be honest, I don’t know the Filipino name for this but it’s a quick and tasty dish. Little one loves his dish and eats all that is in her bowl. As usual, best served with steamed rice.